The RCC mobile library visits Braunston every other week on Monday morning. It stops outside Gainsborough Cottage ( junction of Church St and Brooke Rd ) at 9.50am and stays for 20 minutes. Have a look at the 'What's On' calendar to find the dates, or click on the picture above on the right. The library has a selection of books for adults and children as well as talking books, large print books and DVDs. You can also make free reservations and requests for items that aren't on the mobile library; this can either be done on the library van, or online using the RCC library system selecting 'Rutland Mobile 1' from the drop down list of pickup libraries. You can then pick the items up from the mobile when they are available. The library has wheelchair access via a vehicle lift. 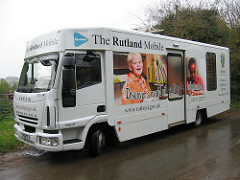 For full details of the mobile library service, have a look at the RCC website.